Although, Earth’s powerful telescopes can probe the skies and focus in on distant worlds, millions of light years away, the Dark Side of our nearby neighbor, the Moon has remained a mystery. Few Earthlings know its history, or the fact that in the days before the Human race began, when the Great Elder Gods from beyond the Milky Way first visited our newborn planet, the Dark Side of the Moon, became a frequent stopping off place, from which these interstellar travelers could venture forth to hunt the reptilian beasts that roamed the primordial world below. Nor do they know that, once these prehistoric creatures were hunted to extinction, above the very plains, on which they perished, great alien cities rose. Now eons later, these once majestic metropolises lie buried, beneath the freezing ice and snow of the Earth’s Arctic and Antarctic Poles. 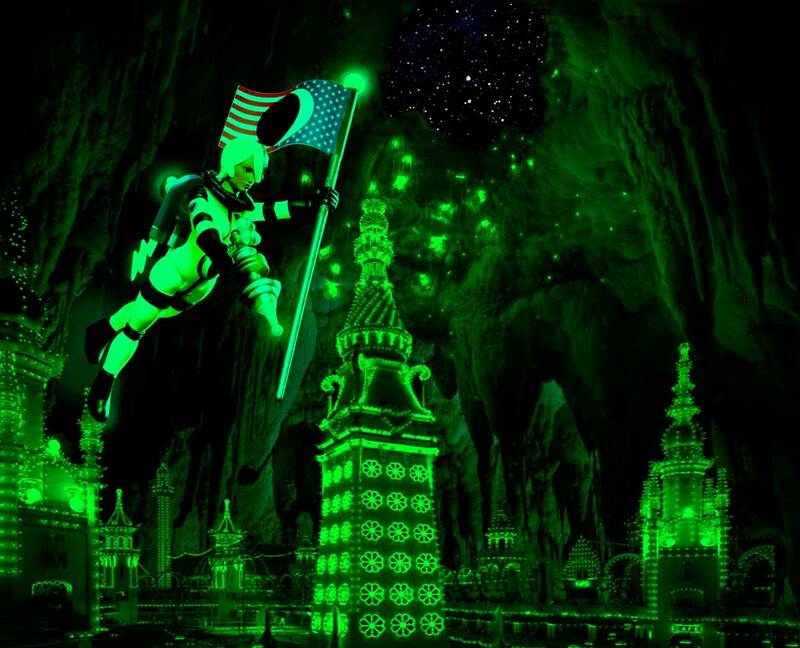 Meanwhile, the lunar bases that the Elder Ones created, deep within the caves and caverns of the Moon’s bleak surface, remain essentially unchanged. And thus, today, the Dark Side of The Moon is inhabited again. 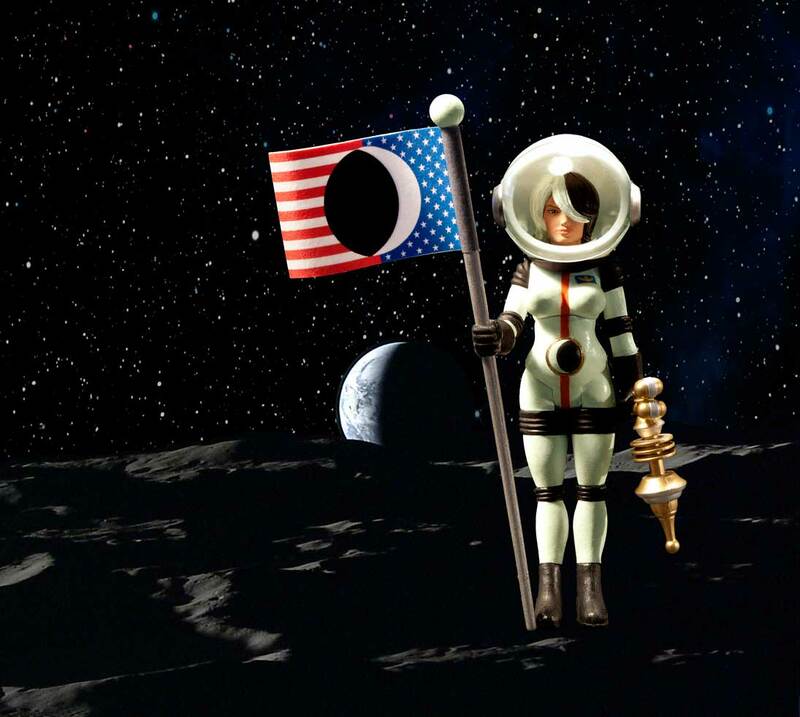 Better known to those brave Earth astronauts who dwell there, as "The Gateway To The Universe," it is from these ancient lunar bases that America's armada, led by the mighty "Starship USA" sails forth to explore the vast expanse of Outer Space. 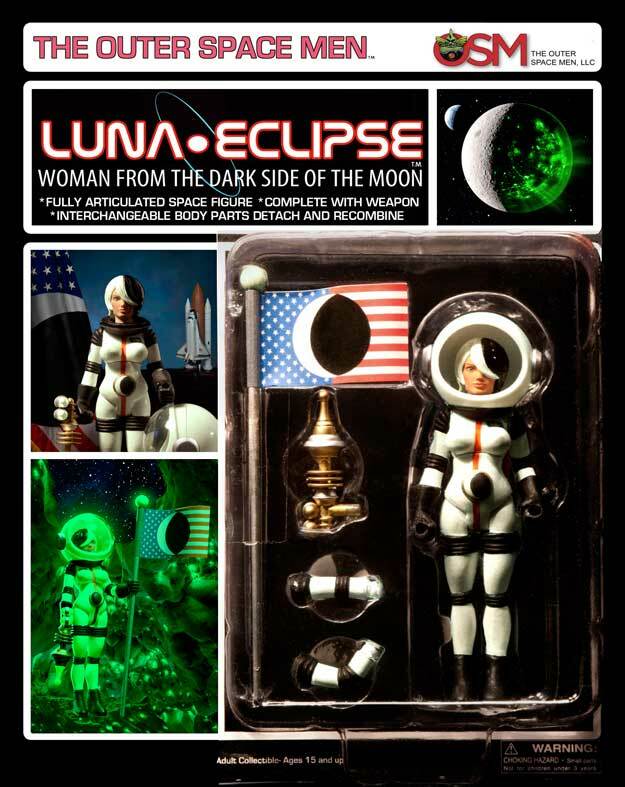 Luna Eclipse is a woman of great mystery, and great history. 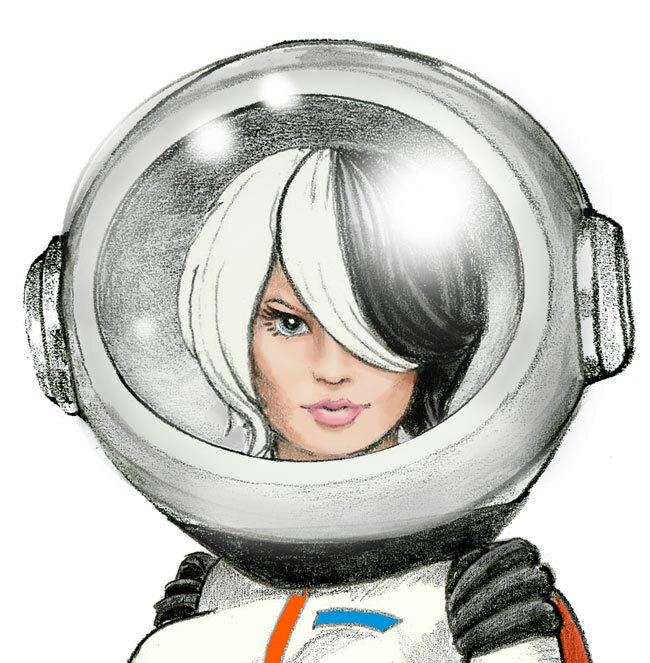 She devoutly believes her destiny, to become a crewman of the Starship USA, stationed in Lumino City on the Dark Side of the Moon was preordained. For Luna Eclipse is the direct descendant of Ezekiel, Captain of the “Starship Wheel” who, in 570 BC was the first Human from Planet Earth to explore the Dark Side of the Moon. 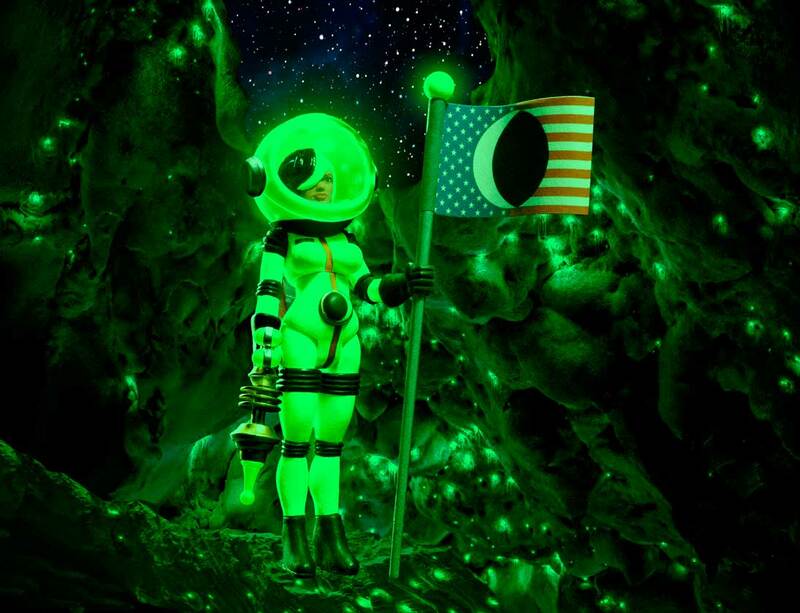 Although, Luna’s biblical ancestor found the majestic subterranean cities of the Elder Gods abandoned, the phosphorescent algae that supplied this ancient race’s light, atmosphere, and food supply, remained. 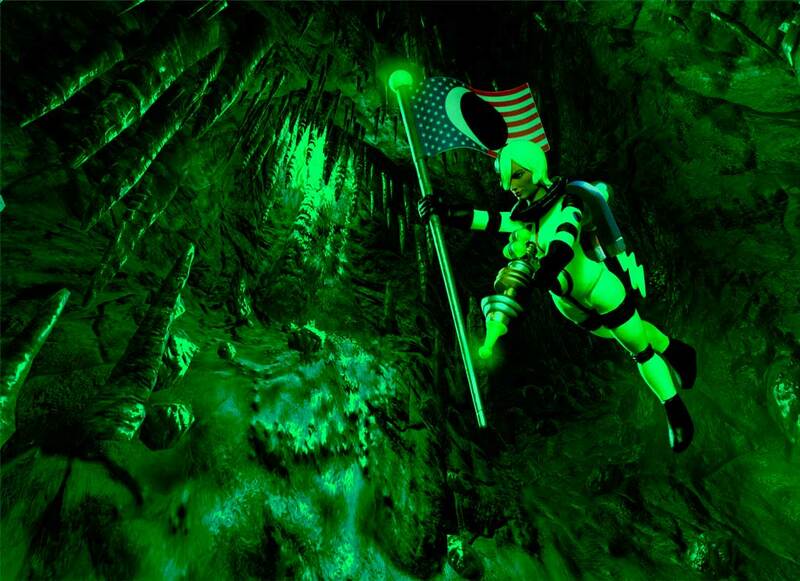 Ezekiel named this life-giving algae, “Lumino.” It still survives and thrives to makes life possible, in the glowing caves and caverns of the Dark Side of the Moon, today. Once more, this humble Earthman has tried his hand at growing the line and the mythology of The Outer Space Men. The challenge was, as usual, to stretch the limits of how much variation and originality could be generated by simply adding two new heads. To make the task more daunting, the heads had to be human. And so, I wracked my brain in an attempt to make these two new Earth astronauts unique and interesting. 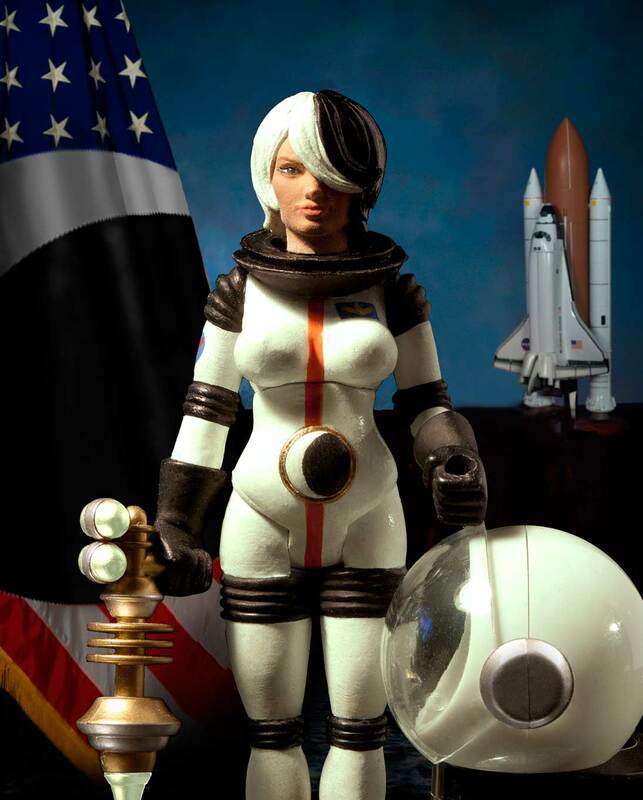 The good news is that master sculptor, Eric Treadway, the foremost genius in the Fabulous Four Horsemen’s stable agreed to continue the tradition of the great sculpting that, thanks to him, has animated the Outer Space Men line, up till now. Thus, the drawings on these two pages have been created essentially for Eric. And the words that follow are intended as a guide for Matt Doughty and his partner Paul, in Hong Kong. 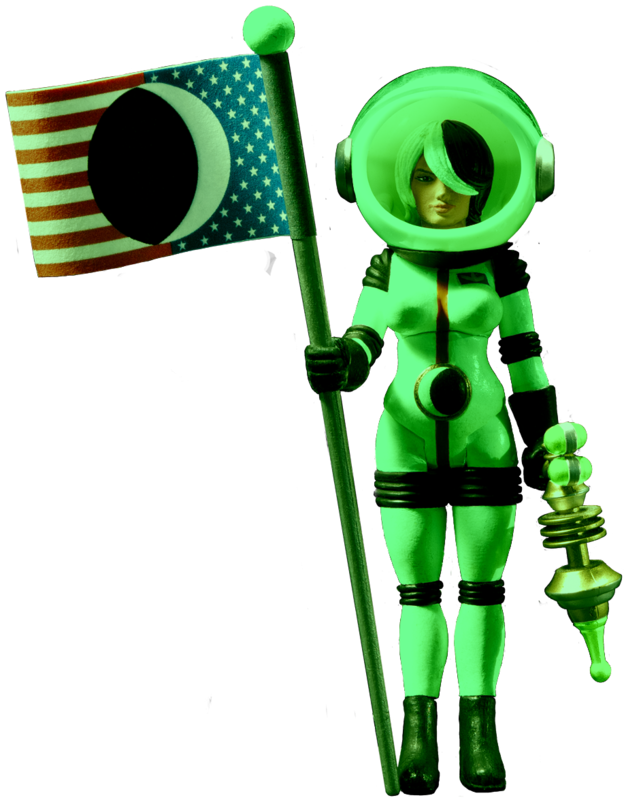 Together, they have been responsible for every perfect detail in the Glyos Outer Space Men line, to date. So, Outer Space Men fans may rest assured that the quality of these new additions will be every bit as good as the first class figures they have become accustomed to. When I first conceived of Luna, several years ago. I visualized her as having hair that was parted in the middle, light on one side, dark on the other, with the dark side eclipsing one eye. Struggling with the drawings, I found that the concept wasn’t working for me. In order for her hair to comfortably cover one eye, it looked awkward, parted in the middle. The breakthrough came when I moved the color change to her left side and let the larger light side of her hair divide to form a crescent moon shape, combining with the dark, to cover her left eye. 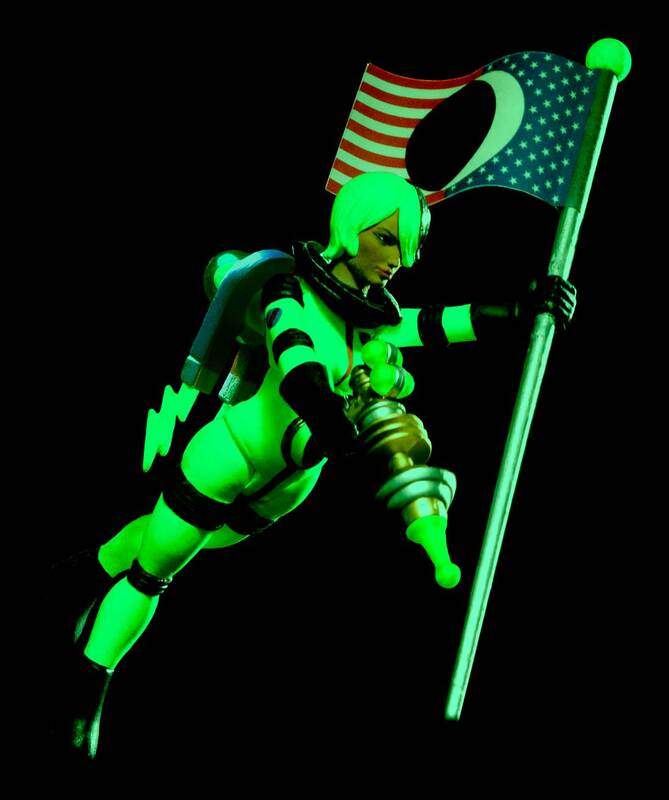 One element that will, hopefully, make these two new characters unique, is the purposeful and primary use of Glow in the Dark. 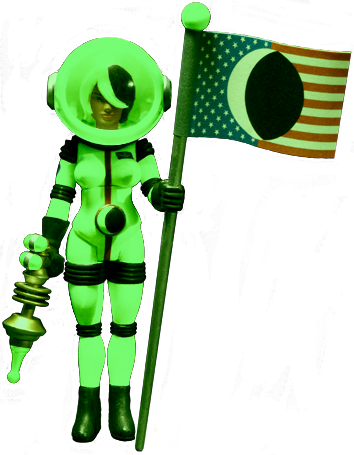 Their spacesuits and accessories, as well as subtle elements of their anatomy will illuminate with an eerie green Lumino glow, not as a later variation, but rather, as an important element in their intrinsic story and design. 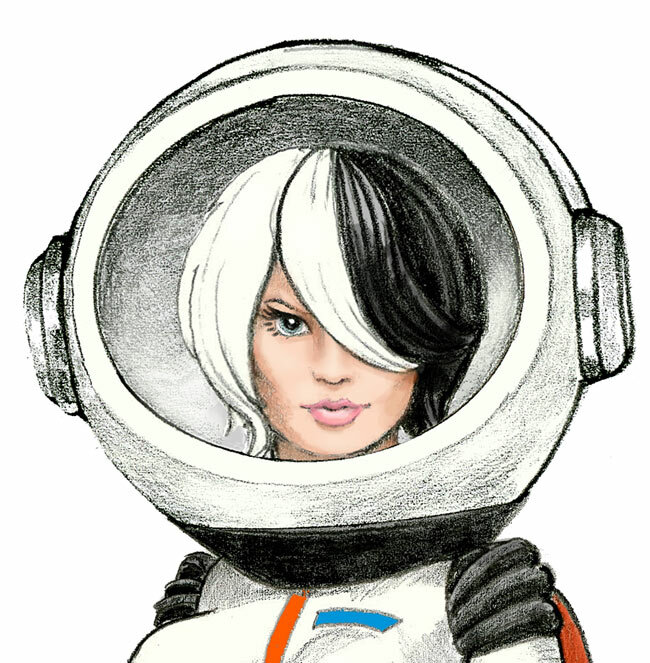 The space suits will be cast in glow in the dark, which is slightly off-white in the light. 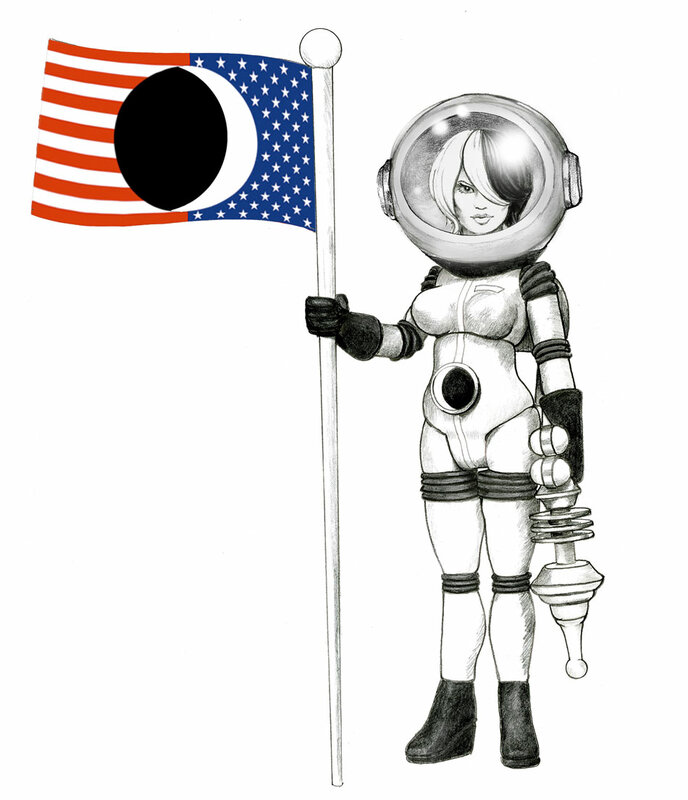 All the other elements will be colored as they are now in the original Earth astronauts, Jack and Terra. The stripe down the middle of Luna and Zero’s bodies, which is white on Jack and Terra, will be changed to the same red-orange as Jack and Terra’s bodies. The earth emblems will be simplified. The gold ring will remain the same, but the actual round emblems will require a new paint mask, leaving a crescent moon unpainted and formed by a black semicircle. The anti-gravity backpacks will remain the same as the present ones, except that they can be cast in the same glow in the dark material as the figures, and the lightning bolts can remain unpainted, enabling them to glow, as well. The ball under the dome should remain unpainted too, so, it will also glow. 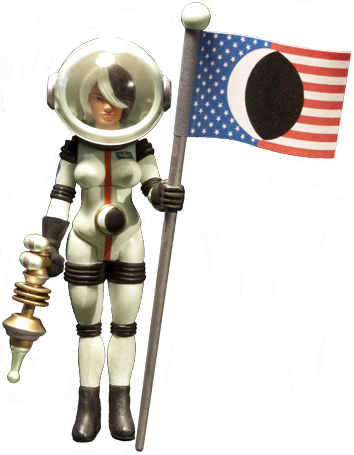 The visors and the dome for the pack pack should be cast in clear plastic, without tinting as in Jack and Terra’s visors. The clear visors are necessary to enable Luna and Zero to see on the dark Side of the Moon, and also make the fact that Luna's hair and Zero’s teeth glow visible. I think it would be too difficult to ask that the whites of their eyes and the highlights on the pupils glow as well, so these can be painted in the traditional way with white paint. The weapons should also be cast in glow, and painted as Terra’s is now with the pointed front and the four half circles unpainted, enabling these elements to glow. Last of all, I have redesigned the flag, to represent the American Moon Colony, using the existing flag as a model for the spacing and size of the painted silver band. 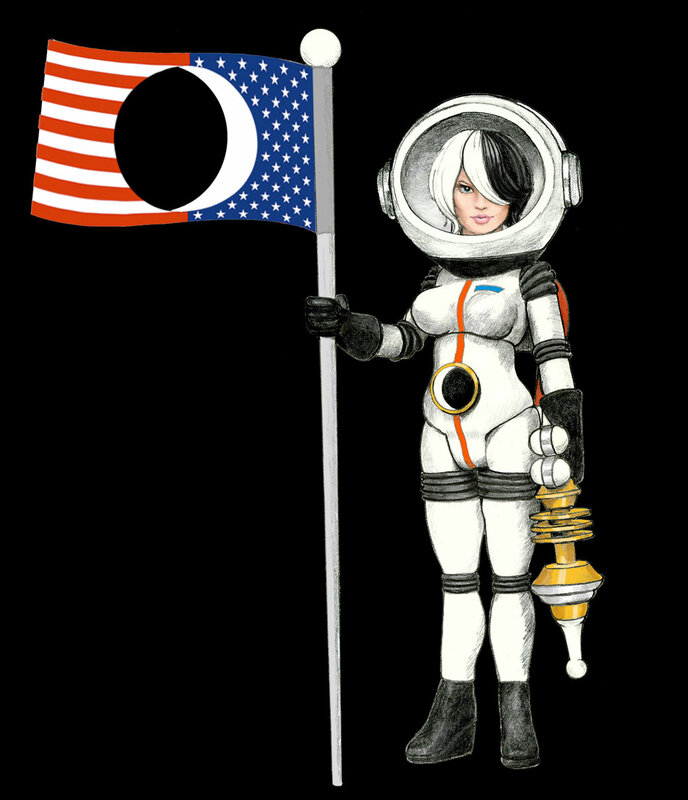 The art that will be included on the CD I am enclosing will print the the same size as the current flag, as shown above. The flag pole should be painted silver. But the orb at the top should remain unpainted so that it will glow. 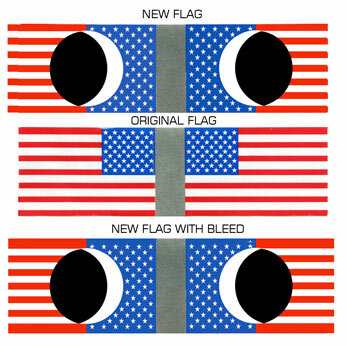 The lower flag on the sheet includes bleed. 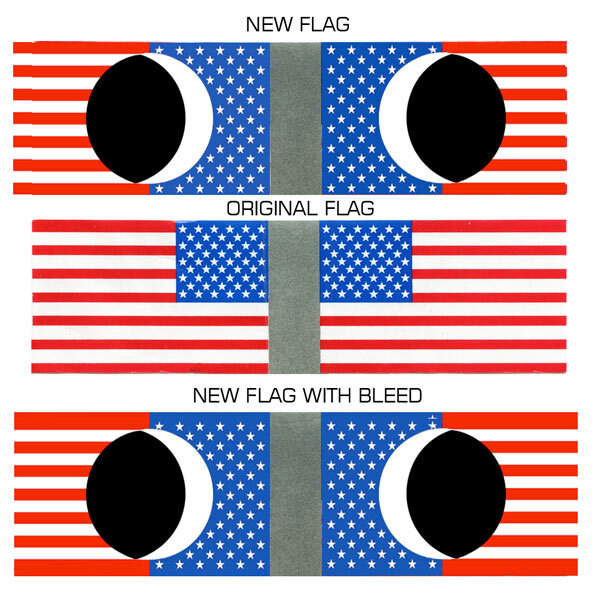 It should be cut the same size as the original flag. 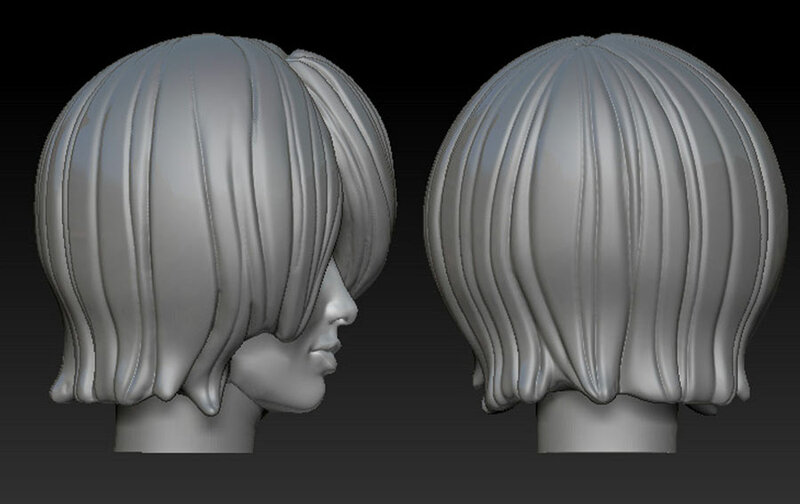 And here it is, Erics first digital sculpt for Luna’s head. At first blush, it looks great. I blush to say, that the more I studied it, the more small problems appeared to me, and I asked to have some minor changes made. I understood that at this stage, unlike when one is working in clay, changes, even big ones, are easy to make. The front view of Luna looks really nice, and when I saw it my first reaction was that you nailed it. And in all fairness to you, a front view was all I offered you to work with. Nonetheless, when I began to study the side views I realized that there really is too much hair, It looks a little like a huge head of hair with a very well done face peeking out of a deep slice. Also the front view needs some minor adjustments. Again this is my fault, I wish I had explained more what I had in mind and how I arrived at the final drawing. 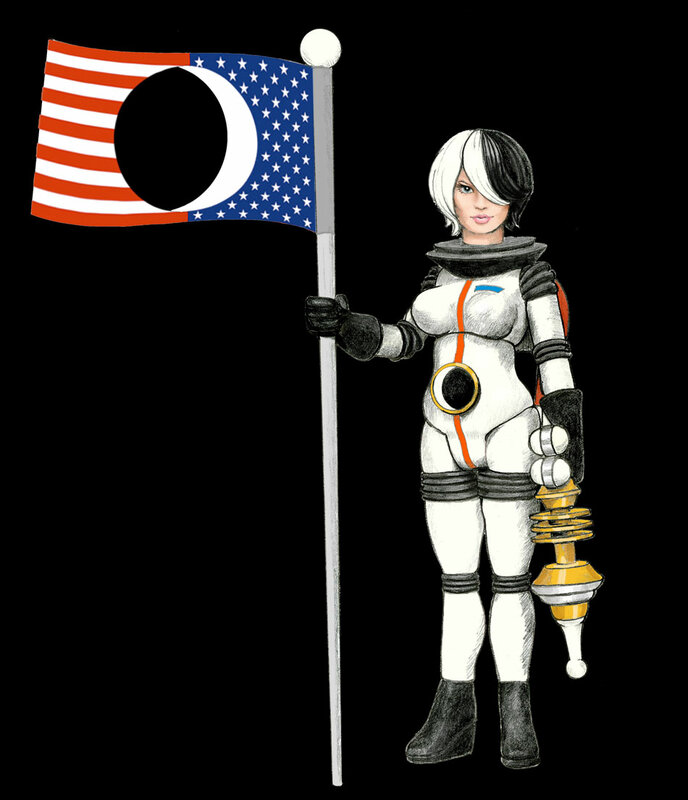 The eclipse theme was intended to be carried out and exemplified by the fact that her hair is half black and half white, evenly divided by a straight line right up the middle and continuing to the back of her head, where a clear line should be indicated subtly in the hair to divide, and serve as a guide for the symmetrical color break, equally dividing the black and white. 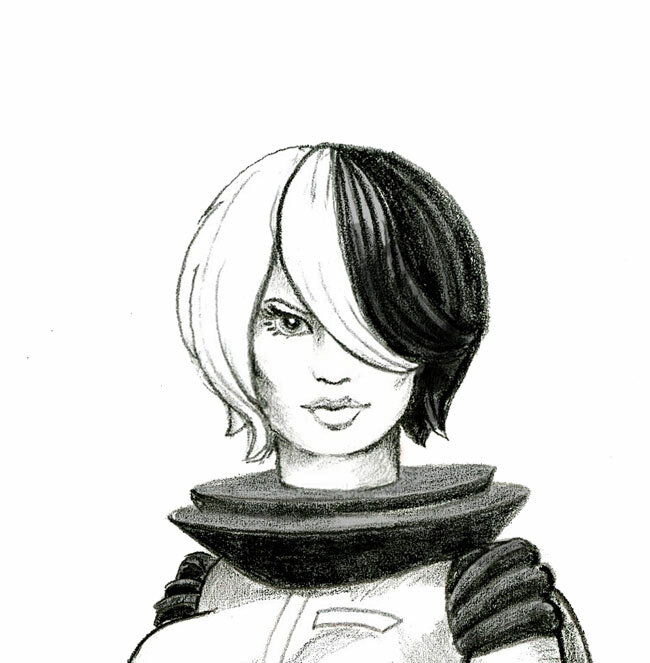 Originally, I visualized her hair as half black half white right down the middle in the front as well. But, now, a strand of white hair originating on the black side of the parting is used to form a white crescent moon. Now Eric sent me his revisions. I thought they were a great improvement, and after conveying my gratitude I continued: I fooled around with her a little bit. My attempts are rough but I hope they convey what I was thinking. 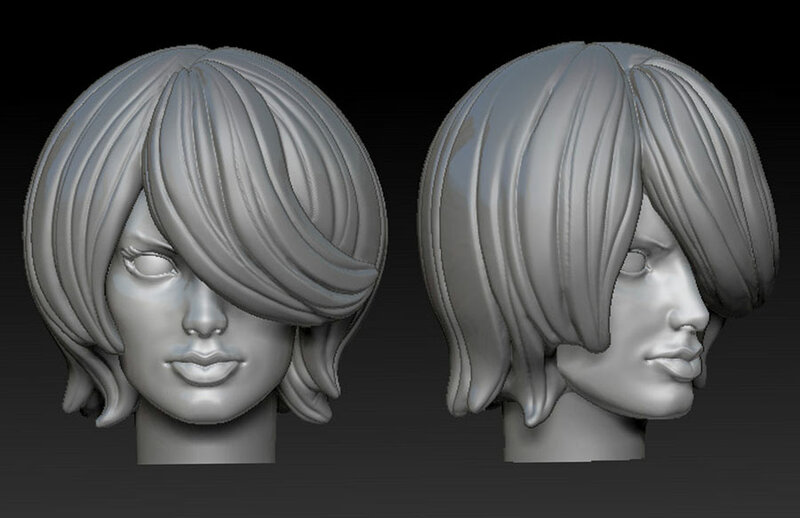 First of all, and hopefully this is an easy thing to do with computer sculpting, as easy as it was with Photoshop? I used Free transform to make her entire head a little wider. I also trimmed that lock of white hair to make it a little shorter and moved the top of the crescent up to come a little higher on her head. Then I was concerned by the length of her jawbone, I made it a little longer on the side view, and tried to bring her hair back a little more. That area where her hair met the end of her jaw seemed a little short and unresolved to me. I was even wondering if some of her ear might show as it does on the left side of Terra. A suggestion! What do you think. If the thought sounds good to you go ahead and do it if not just leave it as it is, most likely there is too much hair there to try that. I also eliminated one piece of hair in that area to try to give the first lock on her left side a more even flow. I didn’t attempt to indicate any of these changes on the three quarter view, but I did show some minor alterations on the side view. 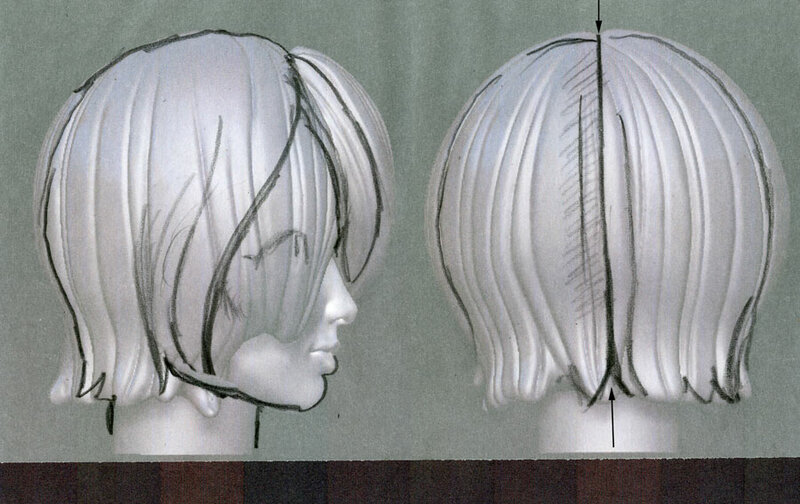 This shows the jaw line and also indicates a little more on the back of her head. I always try to visualize a scull under the hair. Then, Eric made all the changes to Luna, Zero and the third character, and this is what I wrote him back: ERIC, THESE LOOK FANTASTIC, JUST PERFECT! MANY MANY THANKS! Last of all, is this sneak peek at Luna. I’m pleased to see her neck length is just right. Any day now, the final painted version will arrive. Then Luna finally arrived. The photograph below is my favorite. I do believe it’s worth repeating. I love the way the lighting on her face carries out the eclipse theme. This idea occurred to me spontaneously, as I was setting up the lighting. All the images below, have been cropped and transformed into the glow mode. 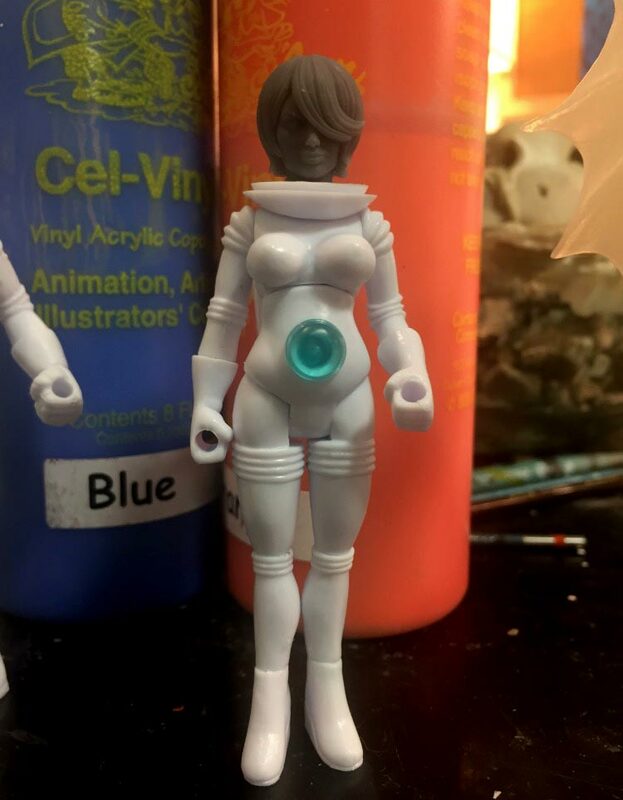 These prototypes are not molded in glow in the dark plastic as the final figures will be. All the effects that you see here, including their slightly tinted shade of white were created in Photoshop. I regret not learning to use Photoshop, years ago. There are so many features I don’t know. I’m discovering these techniques the hard way by trial and error. Here is another favorite pose. 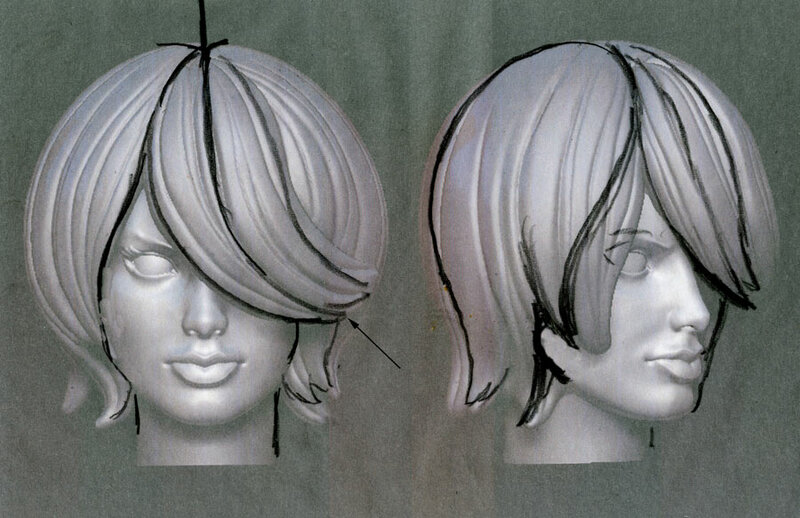 There are some angles, from which her new head looks fantastic. This photo reflects a mood that is distinctly patriotic. I adapted this one quickly to an image that I could use on the back of the package. Technically speaking, this is, most likely, a view that one can’t see from the Dark Side of the Moon. Here we see the above photo utilized in a scene that appears on the package. It represents the caves on the Dark Side of the Moon, illuminated by the life-giving algae, Lumino. I shot this photograph with great difficulty. Setting it up and suspending the figure wasn’t easy. In the end, it never made it to the package. But I did incorporate it into two scenes below.